As Spring takes hold and we start to see our gardens and hills flowering again, we wanted to spend a bit of time talking about the wonderful flowers we regularly use in our soaps, creams and lotions, and what can be beneficial about them. The ylang ylang tree is sometimes referred to as the perfume tree and was originally found in the Phillipines (later in Reunion, Madagascar and Tahiti). It has large flowers which turn from green to yellow and have a strong perfume. Ylang ylang essential oil smells beautiful and comes in several grades. It can be used to infuse coconut oil for cosmetic products but in its superior grade, it is used primarily in perfumery. 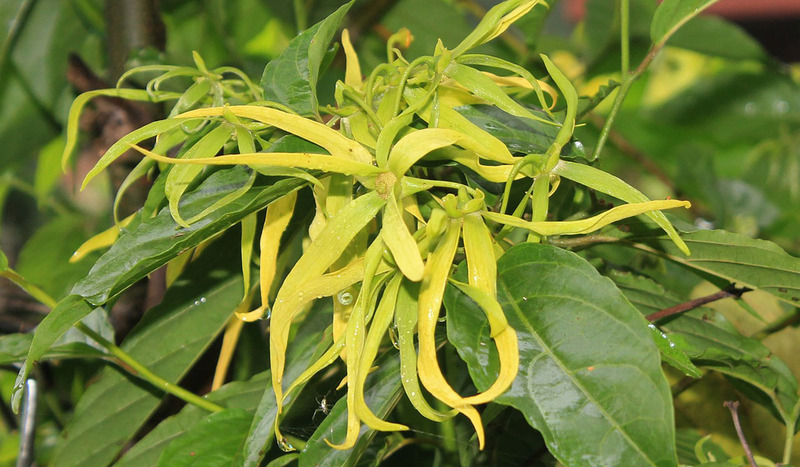 Ylang ylang essential oil has been known to act as a stimulant as well as help soothe and relax. We use ylang ylang in our bath bombs, for that extra touch of luxury and relaxation, really worth the experience. If we were to tell you Geranium essential oil is quite precious and very expensive, you might be forgiven for thinking we have been blind to the thousands of geranium plants growing in gardens and on window sills all over the country. Geranium essential oil isn’t taken from the ordinary geranium sold in garden centres but from the pelargonium, which originates from South Africa and is grown in warmer climes such as the Reunion, Madagascar, Egypt, North African countries, Spain, Italy and France. Reunion produces excellent quality geranium oil. As you need nearly half a ton of plants to produce a kilo of essential oil, this is an expensive treat, but one which smells just wonderful. 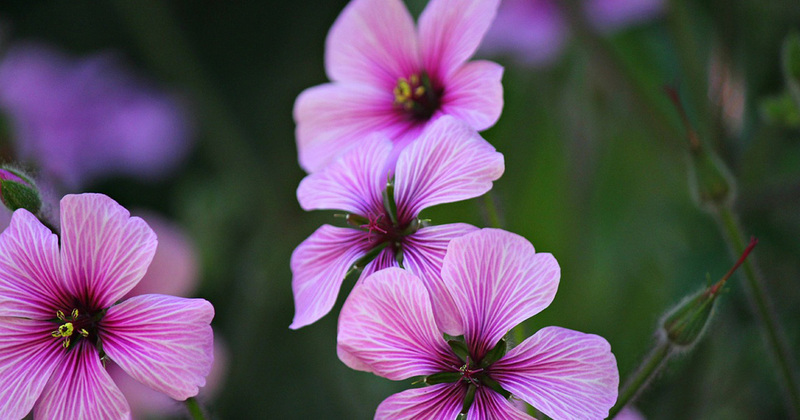 Geranium essential oil is said to aid healing and soothing of both skin and nerves. It also gives you a bit of a lift, probably thanks to its beautiful smell. You may find that warming up a few drops of essential oil in the room can help when working late or studying. We use geranium essential oils in our hand creams. It leaves skin supple and soft and is a great treat and a good investment. What can we say about lavender that you don’t already know? This is an oldie, but a goodie. 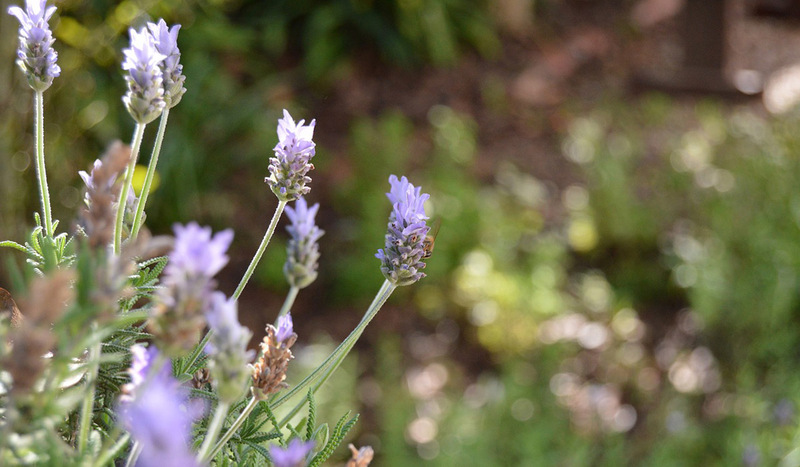 Lavender has been around, mostly grown in Southern Europe but also found throughout Britain, for centuries and has been widely used for its scent and purported medicinal properties. There are different types and quality of lavender essential oils, and French lavender is often described as being of better quality and better scent than some of its counterparts elsewhere. There are vast fields of lavender in the Provence region of France, particularly near the town of Grasse which has made its fortune and reputation on perfumery, originally with the help of lavender. Lavender essential oil is quite the versatile ingredient: it has been associated with healing, e.g. as an antiseptic and as an aid to the healing of burns. It is also meant to help aches and pains and relieve tension and stress. You will no doubt have heard of using lavender spray or pillow sachets to help sleep and relaxation. It may also help soothe acne and balance oily skin and hair. We use lavender in our room fragrances also work wonders for good sleep and good scents, as they have done for generations. Trust in lavender, it won’t disappoint. Camomile is a humble but solid flower. It flowers every year, as if by chance in the middle of a field, and you tend to overlook it, but it is a very useful flower to have around. Camomile flower is very daisy-like. Did you know that the word camomile comes from the Greek for “apples on the ground” because its grows low to the ground and has a scent reminiscent of apples? You will probably have heard of camomile’s properties as a relaxant: camomile tea has been used for generations of an evening, when you want to unwind or some help getting to sleep. Camomile essential oil is said to act in very similar ways, as a sedative and digestive, as well as being antiseptic and anti-allergenic (e.g. against hayfever, etc). 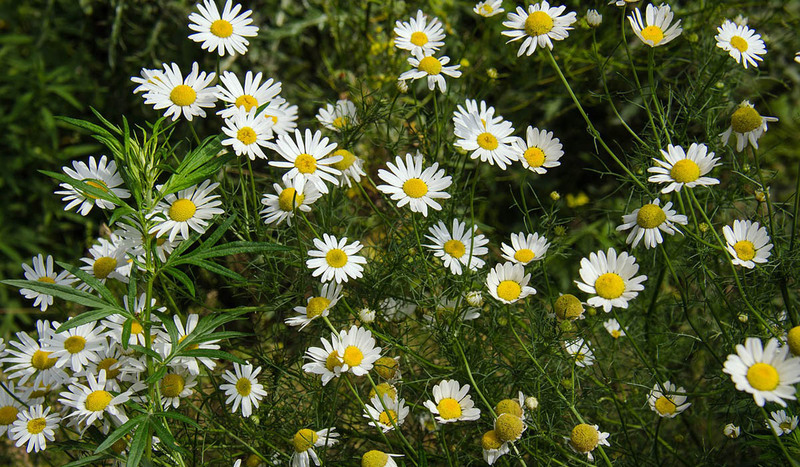 Camomile is very, very gentle and is suited to all ages. It is regularly used with very young children and babies, and has even been known to help with teething (mixed in with some grapeseed oil). It can help soothe inflamed skin and is brilliant for hair, as you will know from decades of hair shampoo ads on the benefits of camomile shampoo. We use camomile in soap together with another amazingly soothing ingredient, calendula. Brilliant for the very young old but the adults will want to give it a try too. We thought we would finish off with the heather. It seems fitting as heather flowers everywhere around the Isle of Skye in summer and autumn, turning the island’s hills from green to purple. 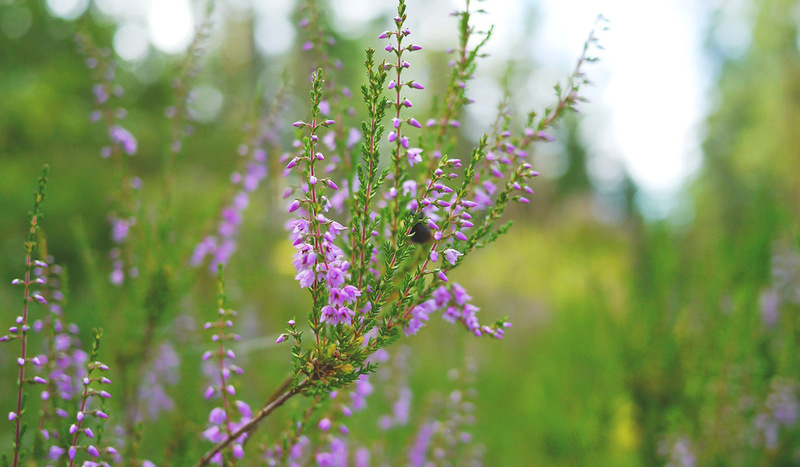 Whilst heather might not the most glamorous of flowers and is not generally turned into essential oil. It is, though, a lovely scented flower, with a good track record of working as an antiseptic and detoxifier. Our heather & myrtle soap, made with heather flowers, is exfoliating and keeps the midges at bay. Not to be sniffed at when spending the warmer months in Scotland! We have reached the end of our little flower power journey. We hope you have enjoyed and have the opportunity to try it out for yourself and enjoy all that flowers have to offer.